TouchPoint�s material gate pass software is programmed to keep track of materials moving in and out of the facility. By automating the entire process of tracking the movement, companies can reduce loss of material and also prevent unauthorized access to materials. 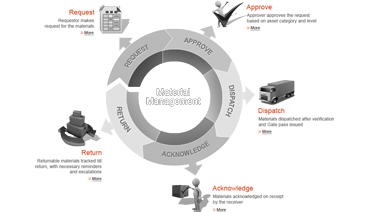 Material gate pass management not only tracks movement of materials (as defined based on the business of the user), but also has the facility to generate auto escalation mails to the relevant departmental heads to report anomalies.